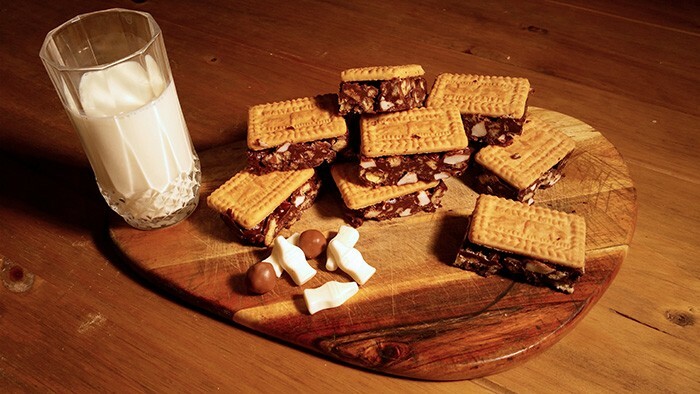 A no bake chocolate tiffin recipe with malted milk biscuits, maltesers, chocolate chip cookies and milk bottle sweets. I love making and eating Rocky Road. It’s so quick to make, no baking required and delicious to eat. And I love that you can put whatever you want in them…whatever biscuits and sweets you have left over! I like making recipes up after Christmas using the leftover chocolates and sweets. When I saw this recipe by Frances Quinn I was desperate to give it a go. 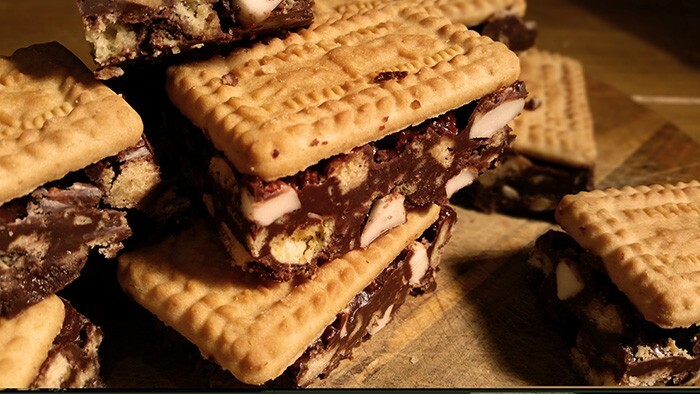 And using Malted Milk biscuits on the top gives you an excuse to cut them all into quite big pieces! I’ll be honest…I wasn’t a massive fan of Frances when she was on The Great British Bake Off. Don’t get me wrong, some of her ideas were amazing. But sometimes I wished she would just make a cake without having to theme it and make it all gimmicky. Anyway I found a reason to make this recipe pretty quickly (although some would ask why you need a reason) and everyone loved them. Definitely worth a try! Grease and line a 23cm square tin. Melt the butter and barley malt extract over a low heat, stirring occasionally until the butter has melted. 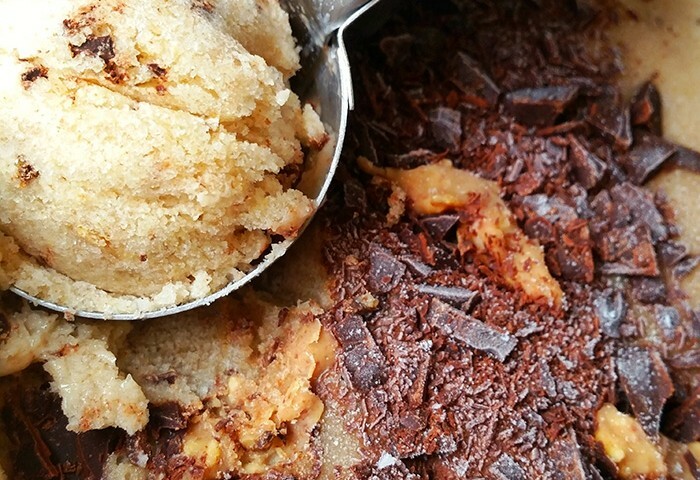 Add all the chocolate and melt until smooth – remove from the heat. 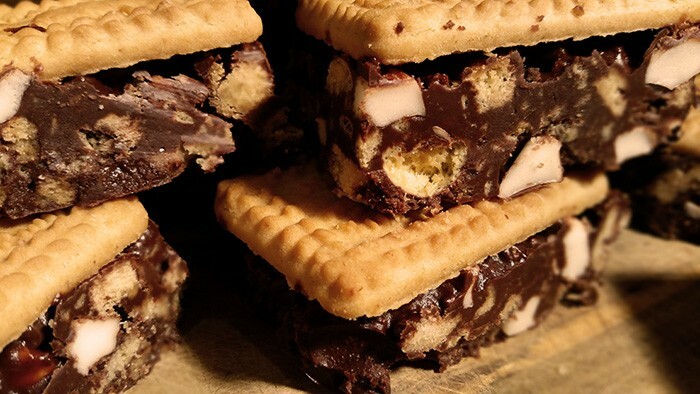 Put 15 malted milk biscuits to the side and put the rest in a large bowl with the cookies and maltesers. 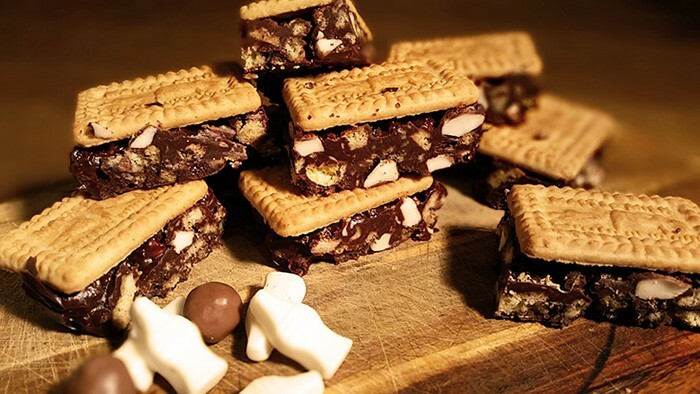 Cut the milk bottle sweets into about 5 pieces each using scissors and add them into the crushed biscuit and chocolate mix. Add the dry ingredients to the melted chocolate mix and stir together. Pour the mixture into the tin and level off with the back of a spoon. 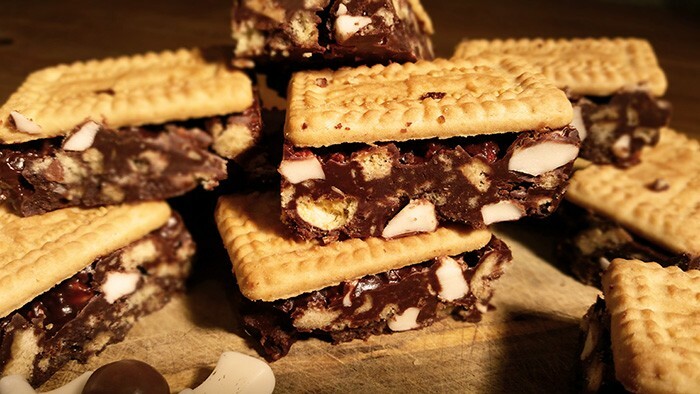 Arrange the reserved malted biscuits on top in three rows of five (make sure you leave a slight gap so you can cut in between and press them down firmly). Refrigerate over night before cutting into portions. These look rather impressive and are a bit different. Everyone that tried one enjoyed them too so it’s definitely a recipe I would recommend. They are also suitable for vegetarians (providing you get vegetarian milk bottle sweets….and this is easier than finding vegetarian marshmallows!) which is great.